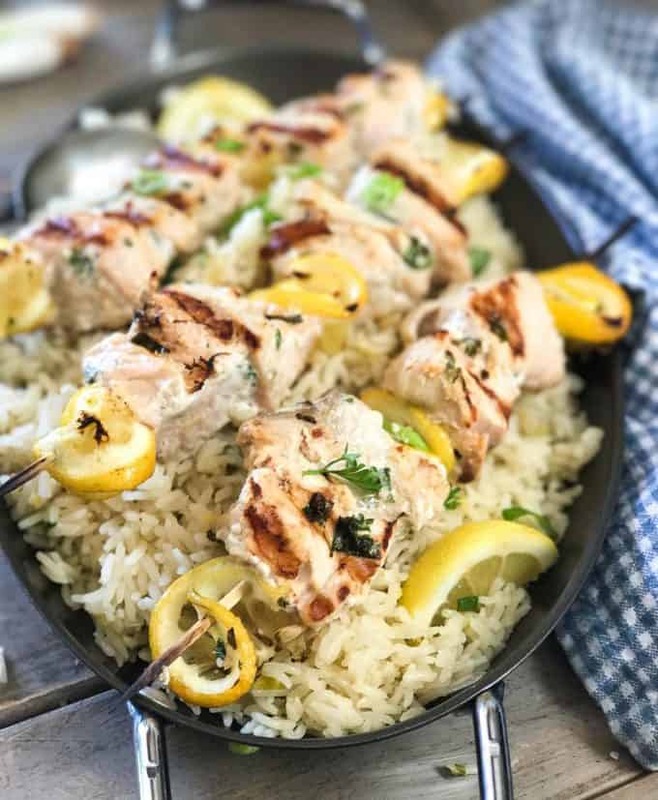 Greek Salmon Kabobs with Oven Baked Lemon Rice! Grill up these easy healthy salmon kabobs while your rice is baking…yes baking in the oven! While your kabobs are kabobbing, the rice is baking up in the oven! It’s all done at the same time and you look like the cooking rock star that you are! 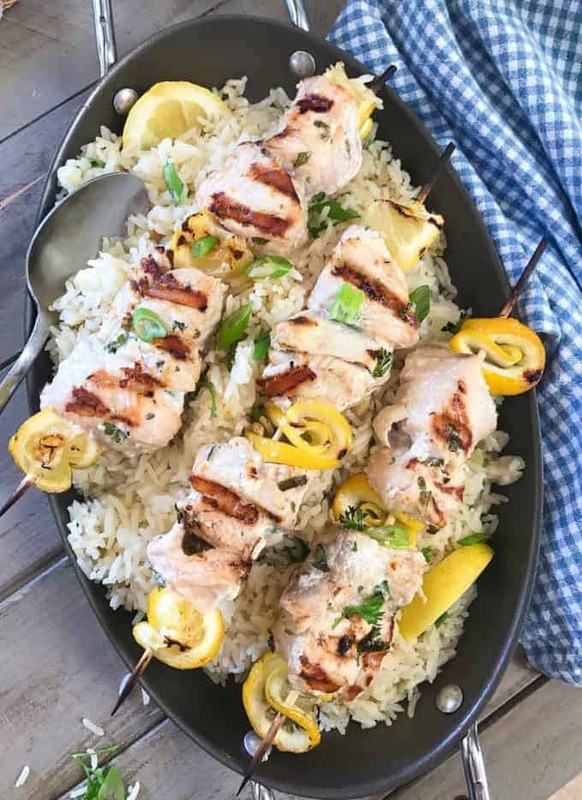 The ingredients for these Salmon Kabobs with Oven Baked Rice are super simple…of course! Simple. Healthy. Fresh. Thats how we roll around here. You probably have most of the ingredients in your cupboard already. Start with a thick chunk of salmon. The thicker the better so you can get nice square pieces to thread on the skewer. Save the flatter tail piece to make a couple Salmon Burgers. Brilliant! The salmon gets a quick marinade of lemon juice, garlic and olive oil. Let that hang while you get the rice ready. 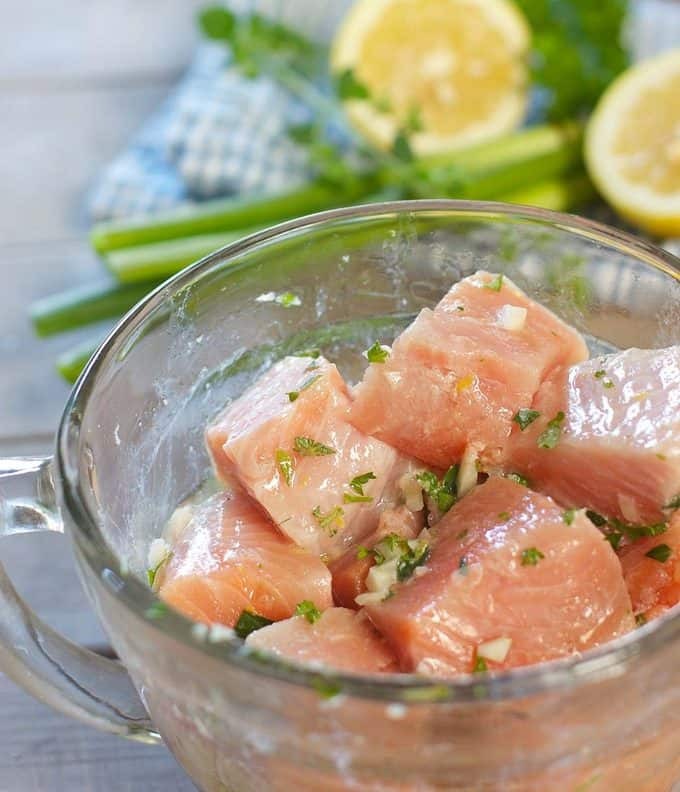 NOTE: Do not marinade more than 60 minutes before grilling or you will ceviche the salmon with the acid of the lemon. Next pour your uncooked rice, onions, garlic and lemon zest into a small casserole dish. 8 x 8 works great. 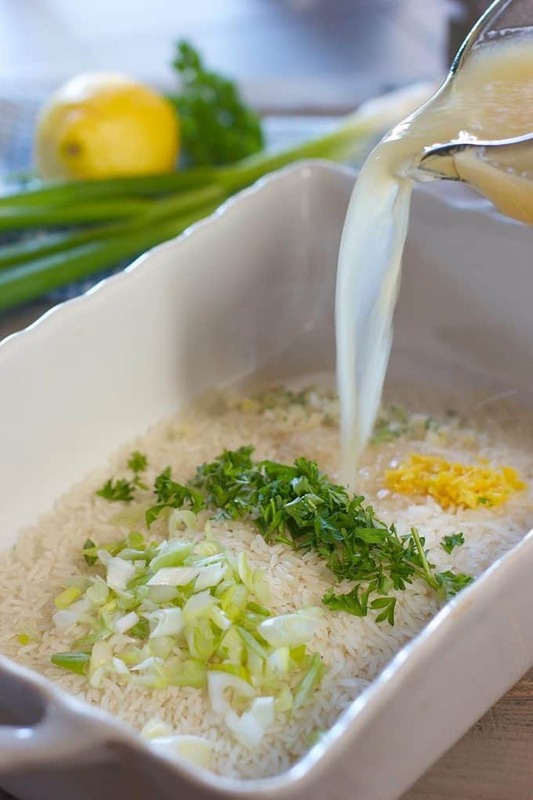 Microwave the broth and lemon juice for 3 minutes and pour over the uncooked rice…are you getting excited? Because this is just so clever! Cover with foil, pop it in the oven for 35 minutes and you have perfect fluffy rice every time. Yay! I love my job! You can use this oven method for brown rice and quinoa as well. See my post : HOW TO OVEN BAKE RICE AND QUINOA. Slice your lemons real thin. Thread them here and there between the chunks of marinated salmon. I have a fear of grills. (also plumbing but thats a story for another time…your welcome). All that popping and crackling when you turn the gas burners on makes me a jumpy cook! But I took one for the team and grilled these up with no help from Mr. Spatula! I am terribly proud of myself for conquering yet another fear. Next week…maybe I’ll unclog a sink or something. Ya never know! Grill the kabobs on medium high heat. DO NOT TOUCH THEM for at least 4-5 minutes. Once the sear is developed they will release from the grill and not stick. Salmon is tender and you have to treat it with loving care. (a little spray stick on the grill doesn’t hurt either). But as a general rule when grilling, don’t touch until the grill marks are developed and sticking shouldn’t be a problem. I just turn these once. Don’t try to grill all four sides, too much touchy touchy and the salmon could get crumbly. 4-5 minutes on each side should do it depending on the size of your salmon pieces. I served this with store bought tzatziki sauce but didn’t include it in the photo because I was still in trauma mode over grilling these bad boys…. More salmon please! You can see all my salmon recipes HERE and below are a few of my faves! Honey Glazed Salmon with Orange and Ginger. Cooked in foil for easy clean up! Herb and Feta Crusted Salmon! – See the rave reviews on this easy to make recipe! To easy, simple, fresh dinners! 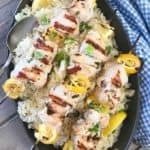 Fresh, healthy and easy to make Salmon Kabobs with an Oven baked lemon rice! Preheat oven to 375 degrees for rice. Combine juice of one lemon, garlic, olive oil, oregano, salt and pepper in a medium size bowl. Add salmon cubes, toss and set aside. Add rice to 8 x 8 or medium sized baking dish. Top with green onions, zest and juice of one lemon, fresh parsley, garlic, salt and pepper. Pour chicken stock into microwave safe bowl or measuring cup and heat on high for 3 minutes. Pour hot broth over rice and stir. Cover baking dish tightly with aluminum foil sealing around edges so no steam escapes. Put in oven for 35 minutes. While rice bakes, heat grill to medium high. Thread skewers with salmon and intermittent slices of lemon. Brush with remaining marinade. Place on hot grill. Do not attempt to turn skewers for at least 3-4 minutes or until they easily release from the hot grill. Cook for 4-5 minutes on two sides for a total of about 10 minutes cooking time. Check to see they are completely cooked throughout. Remove rice from oven and let sit 5 minutes. Carefully remove foil (lots of steam in there!) and fluff with a fork. Serve with tzatziki sauce on the side! 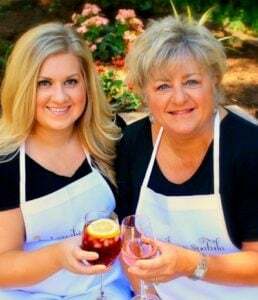 Kathi, You’re the master of saving time in the kitchen! I love this idea of baking rice in the oven. And salmon, of course, is always a favourite here! Thank you a Elaine! We are still enjoying the rice! Seems to go with everything!